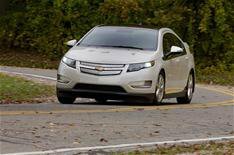 GM plans new life for Volt batteries | What Car? General Motors (GM) is investing in technology that will allow the batteries in its Volt range-extending electric car to be used long after they have exhausted their use in the car. The Volt's batteries will have up to 70% of life remaining after they have gone beyond their practical use in the car. So, GM is working with the ABB Group to build a prototype system where cheap electricity is stored in the expired batteries before being fed back into the national grid at peak times. 'GM's battery leadership position doesn't stop at the road it extends through the life of the battery, including ways we can benefit society and the environment,' said Micky Bly, GM's director of global electrical systems, electrification and infotainment. GM is not the only car maker looking into how best to use expired batteries from electric cars. Earlier this month, Nissan said used Leaf batteries are being trialled as storage units for solar-generated electricity. Creating a useful 'second life' for batteries is expected to give them a significant increase in resale values.